Well – what a week end I had! I am totally exhausted today – but all in the name of good fun of course! Saturday saw me back at the good old Maribyrnong Makers Market – where even though I have only been gone a few months it was like the long lost reunion! It was really great to catch up with everyone again. The lovely stallholders who make the market what it is – the volunteer Committee members who tirelessly work to put on a good show and of course all the visitors who come back time and time again – bringing friends along who have never been or just showing their support by buying everyone’s wares. Pretty much the whole day was busy – which means that time goes super fast and everyone is chatty and happy. I am really looking forward to the next one which isn’t until September! If you haven’t been before – I highly recommend putting Sat 17 Sept in your diaries and making the effort to come along to see what it’s all about. Sunday saw me out for a lovely breakfast at Happy River with friends and then off to Finders Keepers at Shed 4 down at the Docklands. I always love visiting markets – lot’s of the time of course I am having a stall myself and so it is hard to get around and catch up with all my lovely crafty pals. This time – whilst I had planned to have a stall at Finders Keepers – it ended up being too much for me to manage and really if I am honest it was much more fun to visit everyone and have a lovely chin-wag. If you have met me before you know I am pretty much always up for a chat – I really do love meeting people and sharing stories about our creative lives and how we juggle them with the multitude of other things that life distracts us with. The thing I think that really strikes me when I do get this opportunity to catch up with the girls – is how no matter where we are at with our businesses be they small, big or anywhere in between – we all go through similar experiences and come up against things that can stop us in our tracks or challenge us in the creative path that we have chosen for ourselves. The one thing I think I came away with yesterday as I drove up the highway to my new country home – was how I felt part of a gang. A gang of women who are really strong, creative, clever, amazing multi-taskers and who like me have chosen to live their lives for the freedom it gives them and for the satisfaction that comes from turning your hand to the craft that makes your heart sing. Keep up the good work girls! It was great to catch up! 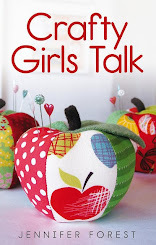 When I was a girl my Mother sewed all the time. There are loads of photos of me as a chubby little toddler with reddish curls – dressed in gingham nappy pants and little matching apron like smocks with cute little iron on motifs on the front. As I got older there were ballet costumes, party dresses and then for my 9th birthday a blue velour dressing gown with frills around the neck and bottom of the sleeves. How grown up I felt swishing around in that dressing gown! Funnily enough not that long ago Mum and I were fossicking in an op shop somewhere and we came across the vintage pattern for that dressing gown – what a hoot! 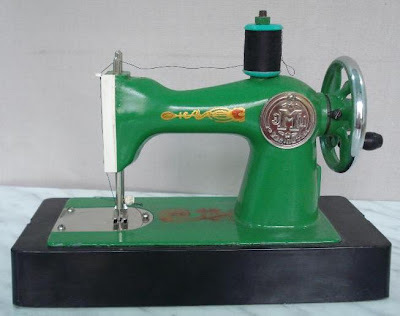 So of course as children are want to do – from the get go I bugged my Mother to let me use her sewing machine. Mum told me stories about when she was a girl and how back then she used to use her Mothers sewing machine to re-fashion hand me down clothing into something she could wear, shortening skirt lengths and turning dresses into tops and so on. It’s only natural then that my daughter Kitty is hot on my heels. 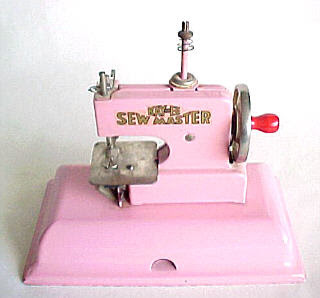 She received her first sewing machine at the tender age of 5 – a gorgeous vintage children’s Singer (thanks Kath!) and has gone on to be given a number of other children’s sewing machines to practice on. The thing is there is never quite anything like your Mothers sewing machine – so as soon as she sees me get to work she wants to make things on MY machine! 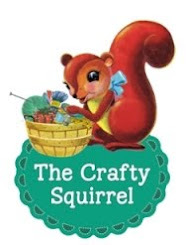 To her credit – she is actually pretty good at it and as my machine is finger operated as opposed to foot operated – she seems to find it easier than I did to sew on. I always remember that my feet were never quite long enough to reach the pedal properly! 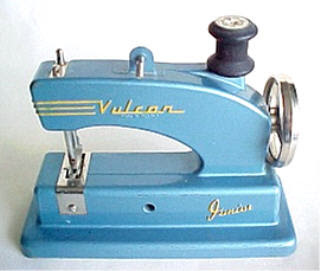 When I first started my business – I used a beautiful old vintage machine I had found in an op shop for $25 and later an egg shell blue 60’s machine (which weighs an absolute tonne). As the business progressed and I needed to use fancier stitches I had to upgrade to a modern machine. Of course I haven’t looked back. Lots of what I do and make today is thanks to my trusty sewing machine. 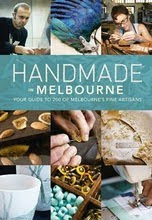 Thanks to Mum for having the patience to give me a go all those years ago and thanks to my High School Textiles teacher Helen Amor – who I have seen recently at various markets I attend – and have been able to reminisce with about the various projects I worked on at school! Particularly the embroidered Mum 4 Dad oven mitt! Congratulations too to Lioness Lady who has won my 100th Blog post giveaway! Congratulations! To celebrate reaching my 100th blog post I am running a little give away! All you have to do to win your very own Rainbow Cast offs scarf is post a comment on my blog telling me what colour you most like to wear. In every colour imaginable the beauty of Cast offs is that regardless of the colours in season – you can always wear your colour. Stay wonderfully warm and woolly! The competition will close on Thursday 24 March 8pm EST. The winner will be drawn via random.org and announced on my blog on Friday 25 March. The winner will also be notified via email - so make sure you leave your email address with your comment if you are not signed in. Giveaway is open to Australian residents only. As I sit here writing I can smell the most heavenly scent of home made pesto. Yum-o! The prospect of dinner is always good – but when you know the dinner has been created out of the bounty’s of your garden – it is even better! Life is good – if somewhat hectic at the moment. The shop is undergoing quite the renovation and looks like a bomb hit it. We have certain deadlines of when things like walls need to be finished before the floor people can come and before the floor people can come the roof plumber needs to come and whilst this is all happening the Electrician needs to come and re-wire bits and then whilst he is here the Carpenter may as well come and build me a new front door and fix one of the leaky windows……you get the drift I ‘m sure. The goal is for the shop to open at the end of May….lets hope that is the case because I have stock arriving here there and everywhere and quite frankly I just want to unpack already. I am sick of living out of boxes and having to open 20 boxes just to find the one thing that I am looking for! On that note…..I must be off…dinner is being served (thank you kind man of the house). And thank you to my gorgeous squirrel children who went acorn collecting on my behalf today. I love acorns!